This pan display case displays 3 full size standard baking sheets. It has two self service doors on the front and two doors on the back. With this unit, you can transfer items straight from the kitchen to the storefront using your own full baking sheets. Baking sheets are not included. This Pan Display Case offers a Quality way to present your items. 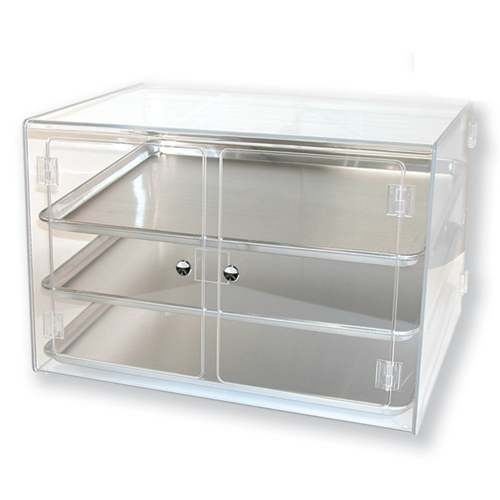 Constructed of clear Acrylic, this Countertop Pastry Display, Food Display is a hassle-free way to display items. Buy Pan Display Case now - Use our convenient shopping cart or give us a call and place your order with a knowledgeable service representative today!